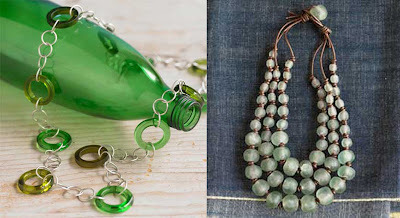 Beautiful necklaces crafted from recycled glass from Viva Terra; The Bottle Rim Necklace made from recycled bottle rims and the African Bead Necklace - made from recycled glass beads from Ghana. 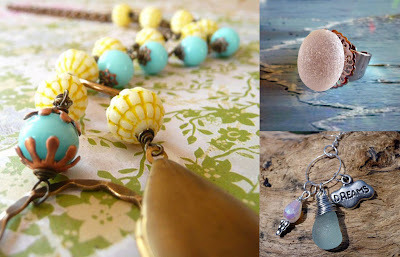 Found on Etsy, the Circus Lariat Necklace - hand crafted from vintage glass beads; Selene Ring - flawless white sea glass gem; Dreams Necklace - crafted from tumbled sea glass, mixed with a vintage bead and lead free pewter. Also found on Etsy, this beautiful Middletown Necklace - the amber piece of glass is surrounded by turquoise; Mojito Earrings - genuine lemon lime sea glass attached to hammered sterling rings. so beautiful & perfect for summer! OH fun - these are lovely!